If you have a lead foot and a need for speed, the 2014 Cadillac XTS Vsport has you covered with a new twin-turbo V6 engine option that punches out 410 horsepower and 369 pound-feet of torque. This is a big increase over the 2013 XTS’ base V6 engine, which carries over for 2014, that produces 304 horsepower and 264 pound-feet of torque, though not as powerful as the 556-horspower supercharged V8 found in the smaller Cadillac CTS-V. Still, some auto writers say that the XTS Vsport should be significantly quicker than the base XTS. “That kind of power boost should make for quite an improvement in the all-wheel-drive XTS’s 0–60 time, which we’ve clocked at 7.2 seconds,” Car and Driver reports. The redesigned 2014 CTS will also offer this new twin-turbo V6 as an option, though it will make 10 more horsepower than the twin-turbo-equipped XTS. Hampden Tener, Cadillac product director, said in an interview at the 2013 New York Auto Show that Cadillac wanted to up the ante of the CTS’ performance with the new twin-turbo V6. “We knew we needed one that would deliver this kind of thrilling, exciting performance, so we started developing the twin-turbo V6 to fill that roll,” Tener said. Cadillac says in a statement that the 2014 XTS Vsport will be available in August. Car and Driver reports that the Vsport model will start at $63,020, including delivery fees. 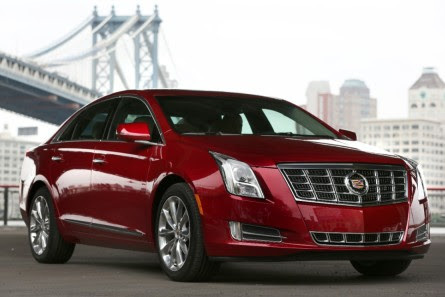 The base 2014 XTS will have a starting price of $45,525, including destination.